Have you ever wondered what you could do to increase your chances of living past 100? 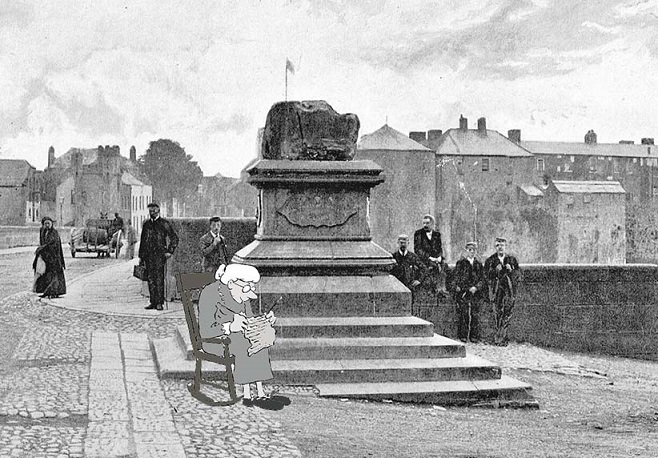 Here we look at all the known Limerick people, those who were born in Limerick or died in Limerick, who have made it to 105 and see what traits they have in common. Some enjoyed the outdoors while others were cloistered, some married while many enjoyed their own company. The oldest Limerick person ever recorded was a single woman, Ellen Richardson, who became the oldest person in Ireland before her death in 2006 at the age of 109 years and 271 days. Ellen was born at 10 Mount Vincent Cottages in the city on 29 May 1896. Her parents William Richardson, a watchmaker and Mary Fitzpatrick both lived in Carey’s Road when they married in 1890. Her family moved to Dublin when she was 4 years old and she remained there for the rest of her life. Another woman, Mary Fitzgerald (no relation of Ellen Richardson’s mother) also remained unmarried for the entirety of her 106 years and 184 days, though she did experience a sense of motherhood, by caring for her seven single brothers into their dotage. Mary was born on 24 November 1902 in Maiden Street, Newcastle West to Richard Fitzgerald, a baker, and Hannie Murphy. She passed away in 2009. Along with Ellen and Mary, Bridget Lane, lived to 105 years and 158 days old. Bridget was born on 14 Oct 1887 in Killeedy. She lived with her uncle John O’Donnell, a blacksmith, in Dromcolliher for at least ten years from 1901. She worked in Geary’s Hotel until 1922 when she moved to Dromcollogher to work as a receptionist for Dr Hannigan. She retained this job until his death when she moved in with his widow to keep her company. She was quoted as saying that she ‘had no one to answer to only the good man above’. Following her death in 1993 she was buried in St Mary’s Cemetery, Abbeyfeale. Two of her sisters Nora Finn and Hannah O’Hara moved to Boston where they both also reached 100. First, Archdeacon Patrick Lyons was born in Kilmallock on 16 March 1893 to Jeremiah Lyons, a farmer, and Bridget O’Keeffe. In 1911 he was a boarding student in St Munchin’s College, which was on Henry Street at the time. He was ordained as a priest nine years later. He has served as the parish priest to Ballingarry for 42 years. Patrick passed away on 1 January 1999, aged 105 years and 291 days. Next, Bridget O’Malley was born in Cappamore on 24 May 1883. In 1905, she entered St Leo’s Convent in Carlow as a postulant and was professed as a nun, becoming known as Sr Bernardine two years later. She spent over eighty years in the convent, passing away in 1989 aged 106 years 196 days. Finally, Bridget Cagney was born in Croom on 2 July 1876, the second youngest of Patrick Cagney and Ellen Irwin’s twelve children. She joined the Presentation Order in Listowel, Co. Kerry in 1895 when she was only 19 years old and became known as Sr Berchmans. She became a teacher in the convent primary school and taught music into her eighties. Two of her sisters and a brother had also taken religious orders. She passed away in 1981, aged 105 years and 160 days. Additionally, the great outdoors and fresh air of a farmer’s life is another tip to conquer 105. Although Louisa Chomley Farran was born in Galway in 21 January 1884, she became an honorary Limerick woman after her marriage to Richard Alfred Blennerhassett in 1907. The couple moved to Crecora, where Richard, who was 26 years her senior, operated a farm. The farming life did not work for everyone, as Louisa out lived her husband by sixty years. She passing away on 12 October 1991, aged 107 years 264 days. Longevity must have been in the genes as all three of her children, Verdun, Grace and Lousia survived her. Susan Naylor nee Micks is another example of the great outdoors extending life. Susan was a farmer’s daughter, born in Adare on the 29 May 1905 to John Micks and Susan Alfred. She married another farmer, William Naylor, in 1931 and lived to the ripe old age of 106 years and 336 days. A more unique example lies with William Geary of Castletown, who while born the son of a farmer on 28 February 1899, his adult life led him in a different direction, far away from the farm. In 1922, he became a Superintendent with the newly formed Garda. In 1928 he was accused of taking a bribe, an accusation that would take over 70 years of campaigning by William to have exonerated, when in 1999 the Minister for Justice at the time granted him a pardon. He later moved to New York in 1928, never to return to Ireland. He reached the age of 105 years 229 days in 2004. Likewise, marrying someone that shares the same surname would appear to have an incredible effect on one’s essential immortality. For example, the oldest person who ever lived was Jeanne Calment (122 years, 164 days). She married her double second cousin, Fernand Calment. This can even be witnessed in Limerick, where Margaret Neville who was born on 31 October 1894 in Ballysteen. She married her sister Annie’s widower, Paddy Neville. She was the fourth child of farmers John and Anne Neville. In her youth she worked in McBirneys (now Debenhams) as a seamstress. She passed away in 2001, aged 106 years and 91 days. Also, Margaret Fitzgerald, born in Patrickswell on 22 December 1877 married Michael Fitzgerald on St Patrick’s Day 1916 in Donoughmore Church. As with many of the over 105s she remained childless. She passed away in St. Camillus Hospital in 1983, aged 106 years and 4 days. Moreover, Maud Courtney nee Stanhope was born in London in 1881. In 1904, she married Charles Courtney, a tea agent. By 1911 the couple, and their daughter Kathleen, were living on the Ennis Road, later living on the Corbally Road. Maud out lived her husband by 30 years, passing away at the age of 105 years and 225 days on the 8 April 1987. Her funeral took place at St Mary’s Cathedral. Meanwhile, while there are many examples of remaining unmarried, or marrying someone with your own surname, or spending enough time in the great outdoors; there are also the cases in which people simply lie about when they were born, like in the case of Michael (Mick) Murphy of Clarina. When he died in 1917 his age was recorded as 109, though it is impossible to confirm this. His wife Margaret also lived into her nineties. Finally, if only just to prove that there is not any one secret to long life, we have Margaret ‘Bridie’ McNamara, born in Glin on the 14 February 1912 to Martin McNamara and Margaret Clogan. She married Don MacNeil while in Nova Scotia. She lived in both America and Canada for over 80 years, and had no children. She returned to Limerick following the death of her husband in 2002. Today she is still going strong at aged 105 and counting. The Scanlan family of Ballyduhig (near Dromcolliher) had being a centenarian in the blood. from Co. Limerick in 1882. Jeremiah was baptised on the 29 October 1862 in the parish church of Killeedy. In 1911, Bridget was living with her son Patrick and his family at Ballyduhig, Mountplummer, Limerick. She was recorded as 92 years old, could read and write and could speak both English and Irish. While ten years earlier she was recorded as 84 years old. While her age recorded on her death certificate in 1917 was 101.